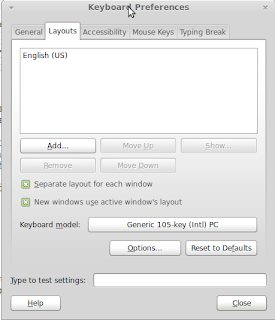 This article continues the series about keyboard layout configuration techniques in different desktop environments, currently available for Linux distributions. Last time we spoke about the three leaders, as measured by total numbers of users: Unity, GNOME 3 and KDE. 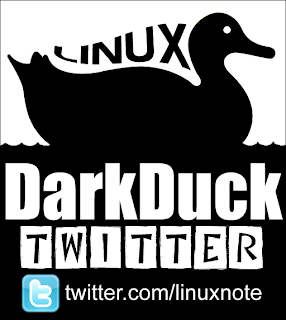 In the future, we will also speak about LXDE, Enlightenment, Openbox. Today we look at the second echelon: Xfce, Cinnamon and Mate. Xfce is a desktop environment that is very light on resources, and is capable of running successfully even on low-end hardware. 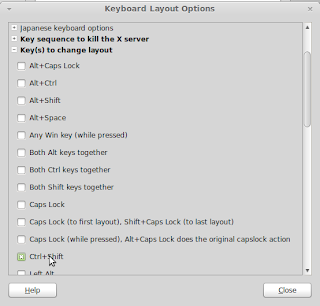 The process of setting up different keyboard layouts in Xfce starts from a slightly different end than all other desktop environments. First of all, you need to right-click anywhere on the panel and select the menu option Panel - Add new items. In the list of the items, select Keyboard Layouts and add it to the place where you want to see the indicator. 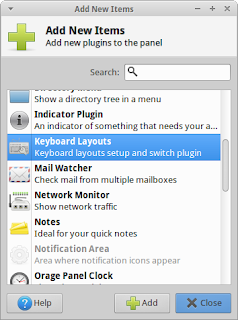 If the Keyboard Layouts item is not in the list, please check and install xfce4-xkb-plugin using your package manager. By default, your indicator shows an American flag, meaning that your default keyboard layout is English US. 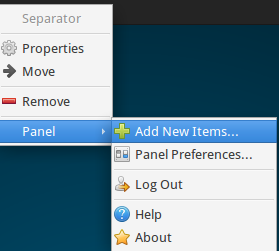 To change that, right-click the panel indicator and select the menu option Properties. The middle part of the new window contains a list of active layouts - simply add the layouts you need and delete the layouts you aren't going to use. Just above the list of layouts, there is a drop-down list of the switch hotkey options. Select the one you prefer there. And finally, below the list you have an option to select between the indicator being an image or a text. 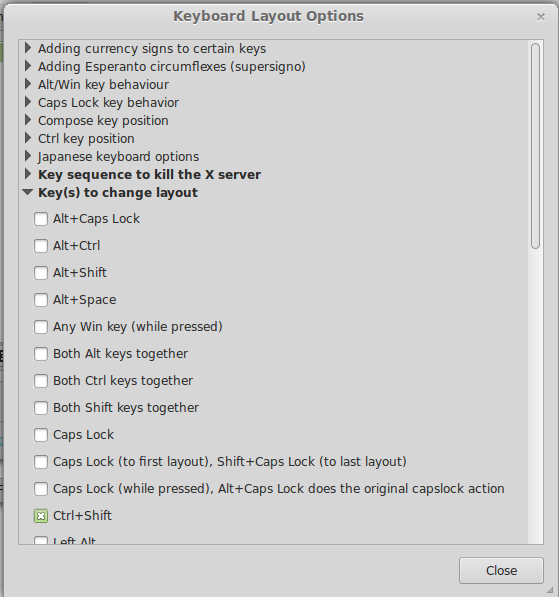 Voila, you can now use in different layouts in Xfce, and use a hotkey to quickly switch between them. Cinnamon is a relatively new player on Desktop Environment "market". It came as a response to a new approach the mainstream GNOME 3 developers took, namely the widely unpopular GNOME Shell. 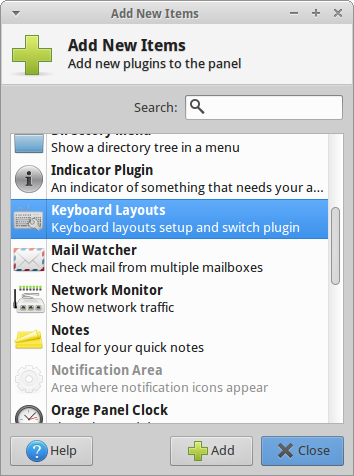 Cinnamon is based on the same GNOME 3 core, but has a totally different look, one more familiar to most computer users. The Cinnamon Desktop Environment is in active development. Configuration elements may change from one version to another. 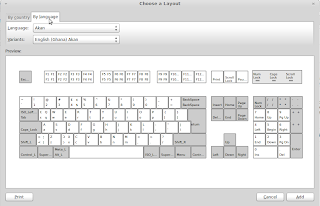 The guide below tries to summarize steps for keyboard layout configuration in Cinnamon 1. If you use Cinnamon 2 and later (for example, Linux Mint 16 and newer), your guide is published here. 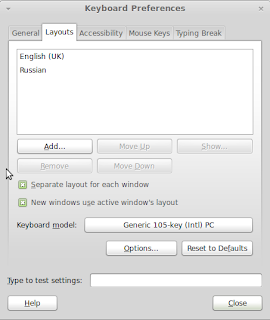 The settings for Keyboard layouts in Cinnamon are part of the Region & Language panel, similar to GNOME 3, or there may be a separate Keyboard Layout item in the Preferences menu section. You can find it in the Preferences part of the menu, or by trying search of keywords "keyboard", "region" or "language" in the search field. The Layouts tab is what we need. 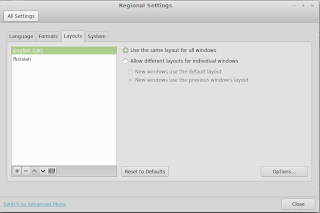 Use "+", "-" and arrow buttons in the left part of the window to configure layouts you need in the preferred order. As soon as you add the second layout, an indicator appears on the panel. Right-clicking on that indicator allows you to switch between the text and the flag indication. 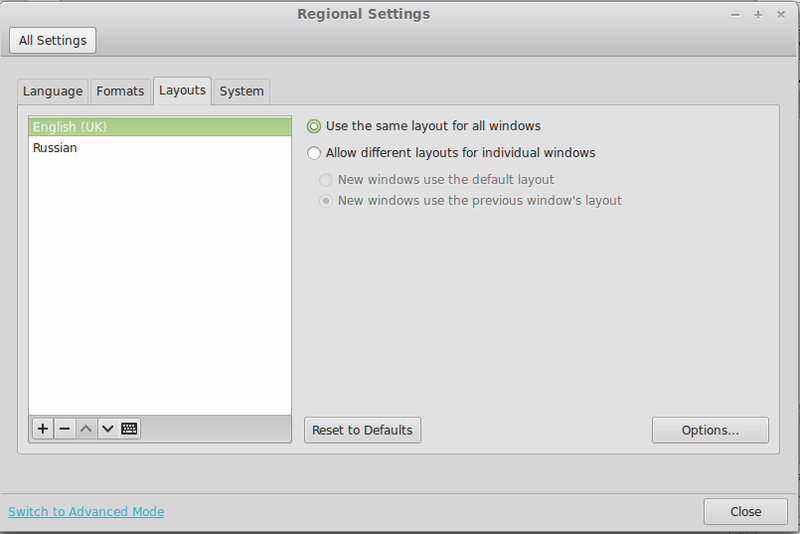 Now click Options button on the Regional Settings panel and configure the switch hotkey you like. Voila, you can now type in different layouts in Cinnamon, and quickly switch between these layouts with a hotkey. MATE is a desktop environment that was forked from GNOME 2, when the main GNOME team decided to move to GNOME 3 project and GNOME Shell. 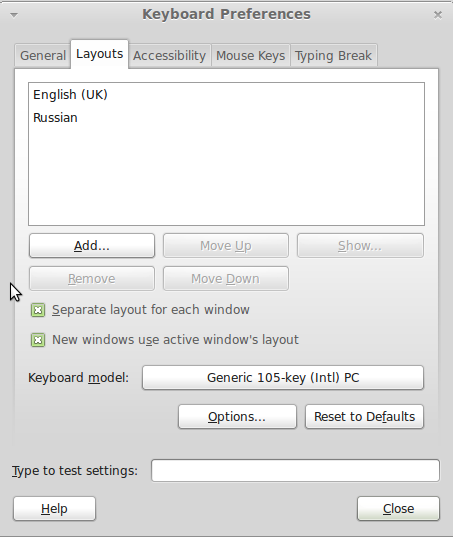 The settings for Keyboard layouts in MATE are part of Keyboard configuration in the Control Centre. You can find it through the Control Centre in the MATE standard menu, or by typing the word "keyboard" in the search bar. 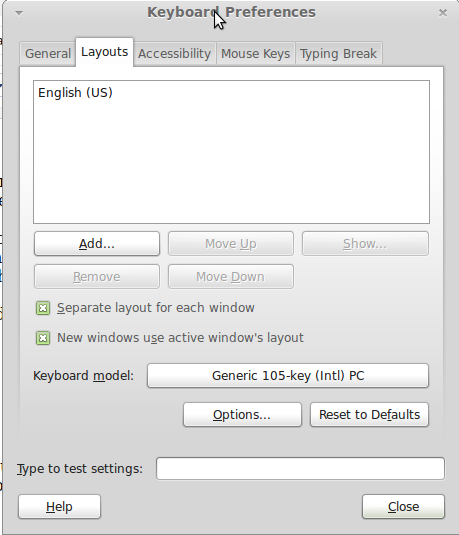 Once you call up the Keyboard Preferences window, go to the Layouts tab. 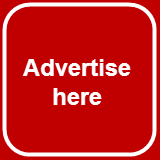 Use buttons "Add", "Remove", "Move up" and "Move down" to rearrange the list the way you need. If you have more than one layout in the list, the indicator in the system panel appears. 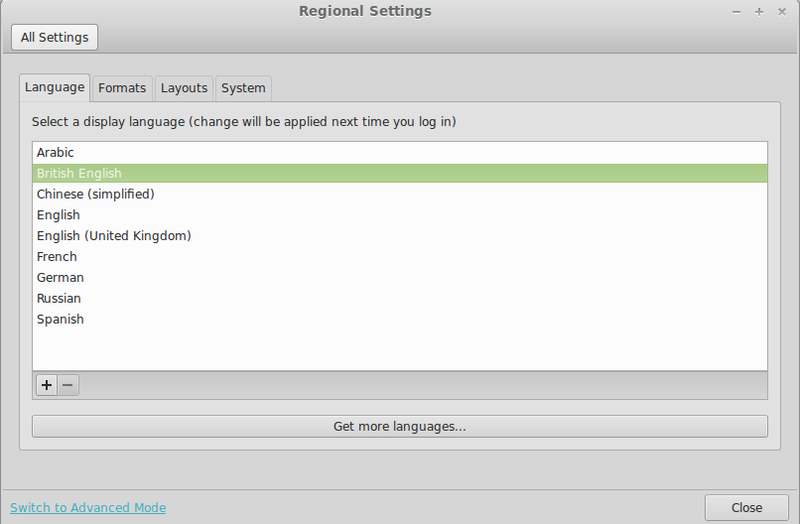 When adding a new layout, you can search for it either through the list of countries, or through the list of languages. Repeat the Add/Delete functions until you have the result you need. After making the list, click the Options button and then choose the keyboard hotkey for switching between the layouts. Voila, you can now type in different layouts in MATE, and quickly switch between these layouts with a shortkey. These are three more Desktop Environments from the list of available for Linux. Do you want to hear about the keyboard configuration in other DEs? Please comment below. 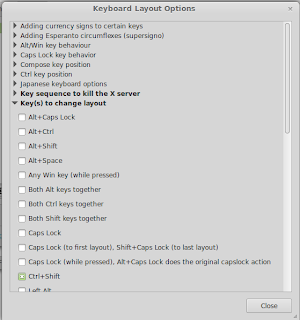 Thanks for the tip on keyborad hotkey for layout switching !! No flags instead of letters in Mate for the keyboard layouts? Hi DarkDuck, thanks for this enlightening article (as I'm rather novice)! I came here in search of a solution as I installed xfce4 on top of WSL (i.e. not from a nicely packaged distribution) and as a result I'm missing the keyboard and console setup (the list of kbd models to choose from is empty, us layout is the only offered, add button greyed out). Would you know the setup process that would ask me for my kbd layout and default language ? Sorry, I can't really help here. No worries and thanks for this quick feedback! I'll bounce back here if I get an answer worth to be shared.